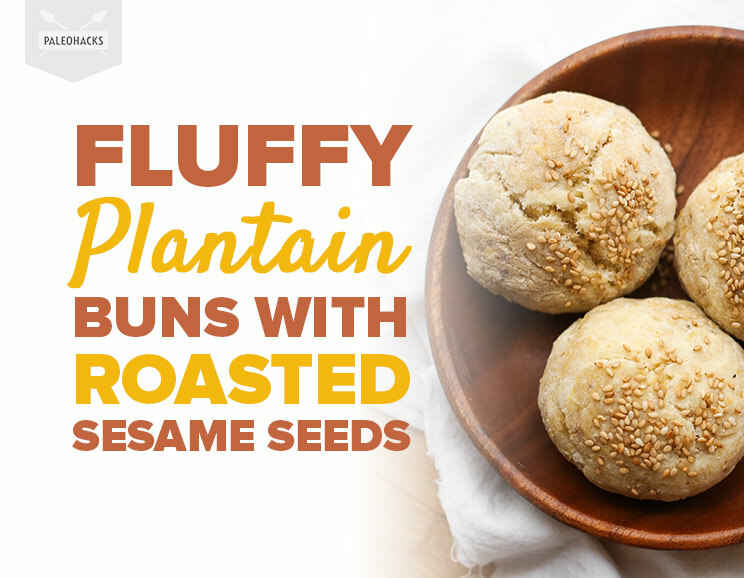 Bake up grain-free Paleo Plantain Buns with roasted sesame seeds in just 30 minutes! Love a good dinner roll, but are sick of rock-hard breads with no flavor? Try whipping up these golden plantain buns! 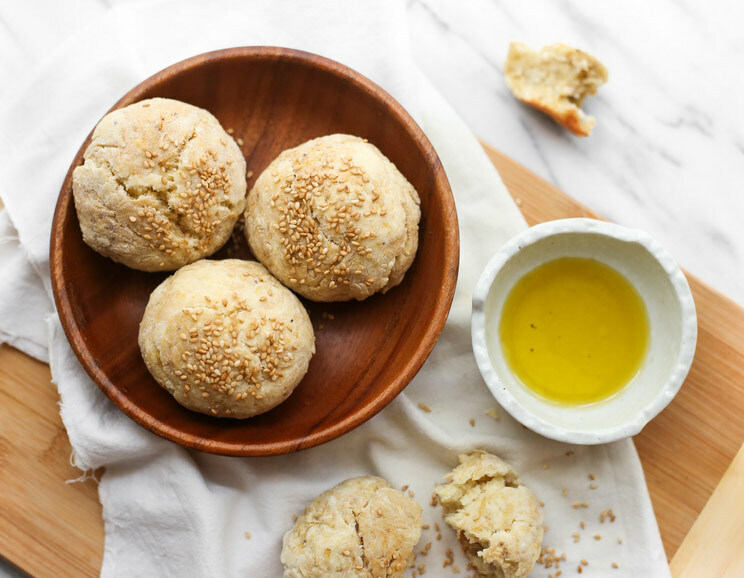 Soft on the inside and crisp on the outside, these buns are a cinch to make and only take 10 minutes to prep! Serve them with dinner or munch on them as a snack in between meals. Plantains are naturally sweet in taste and can help nourish probiotics in your gut. When mixed with coconut milk, it creates a light and airy dough that fluffs up when baked. Add toasted sesame seeds on top or experiment with fresh herbs for more flavor! To get started, peel and shred the plantain with a hand grater, using the side with the smallest holes. Sift the tapioca starch, almond flour, baking powder, and salt into a large mixing bowl and gently whisk. Add in the wet ingredients and mix together to form a dough. Tip: Add an extra tablespoon of tapioca starch if the dough is too sticky or add a tablespoon of coconut milk if it’s too dry. Next, divide the dough into six equal parts and roll each portion into a small ball. Place the balls onto a greased baking sheet and brush the tops with olive oil. Sprinkle with toasted sesame seeds on top and bake for 20 minutes. Serve warm and enjoy! 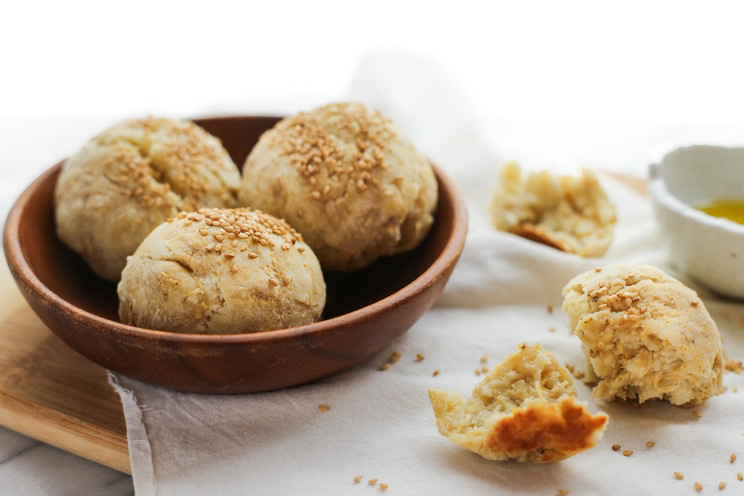 Bake up grain-free Paleo Plantain Buns with roasted sesame seeds in just 30 minutes. Preheat the oven to 350°F and grease a baking sheet with olive oil. Peel and grate the plantain, using the side with the smallest holes. In a large bowl, sift the tapioca starch, almond flour, baking powder, and salt. Whisk well before adding in the beaten egg, coconut milk, and olive oil. Use your hands to add in the shredded plantains and fold the ingredients into a dough. Divide the dough into six equal pieces and roll each one into a small ball. Place the dough balls in a single layer (at least two inches apart) onto the prepared baking sheet. Brush the tops with olive oil and sprinkle sesame seeds on top. Bake for 15 to 20 minutes, or until the tops of the buns are golden brown. Serve warm with olive oil and enjoy!